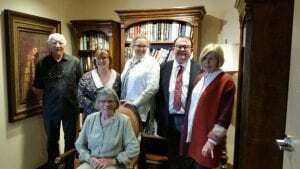 Over the past two weekends a group of six from Northumberland Players have visited four retirement residences in Cobourg and Port Hope where they have ‘performed’ a reading of a one-act play. All audiences were very appreciative. The group rehearsed for three sessions, and planned the presentation for minimal tech. There were a very few props and costumes, and just four chairs and a table for a set. These performances are the latest in what has become an on-going program under the leadership of Mary Doig and Jackie Tinson. It started as a way of raising money for Barnum House. It soon expanded to taking performances to audiences in retirement homes who cannot come to the theatre. Because there are many actors who will take on roles for the love of performing, this is a winning idea for all. Thanks to Chris Worsnop for directing this one. Northumberland Players is proud to support these performances. 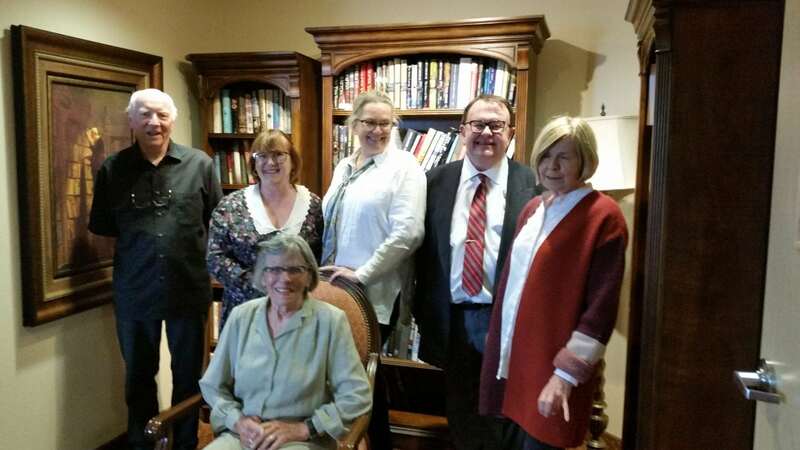 In this photo taken after the final performance, from left to right: Chris Worsnop (director), Judy Down, Kim Brouwer, Grant Coward, Jackie Tinson (producer), and seated, Mary Doig.